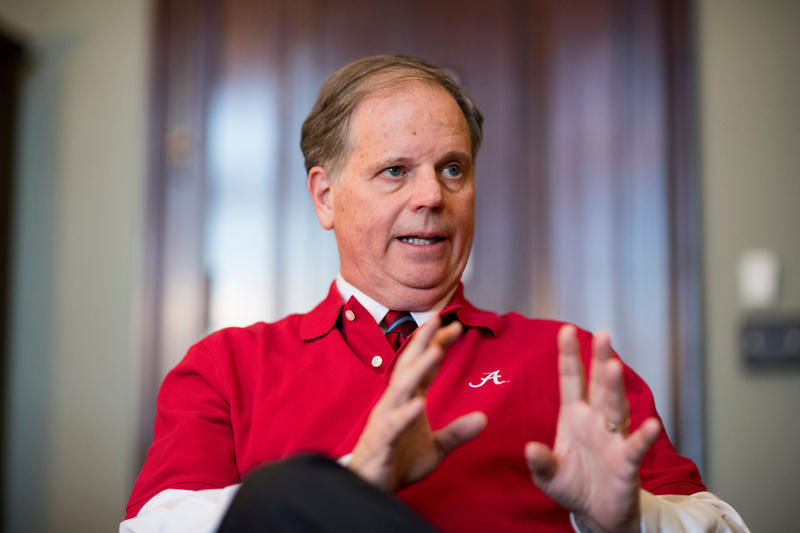 Freshman Sen. Doug Jones, 63, an Alabama Democrat, talks about his love of hunting, hatred for intolerance and working for former Alabama Democratic Sen. Howell Heflin on the Senate Judiciary Committee. Q: What has surprised you so far about Congress? A: Well, I don’t think I was fully prepared to be as recognized as I was after this election. I mean last week was just — the number of people that would stop you and say hello. Just random folks. But I think that was kind of unique to my race. I’ve been in and around the Senate and House for a long time. I started here, so I haven’t seen a whole lot of surprises yet. It’s still a learning curve on issues, but everything right now seems to be going as I hoped it would. I just can’t get stuff on the walls quick enough. Q: If you could change one thing about your campaign, what would it be? I would like to have not gotten bogged down in all of those crazy allegations against my opponent, because that was such a distraction. It was very difficult to stay focused and to stay in our lane on what we believed to be the really important issues of the day. Not that those issues were not important — because they certainly were important — but I really wanted the folks from my state to know me. It was difficult for us to try to navigate having to deal with all of those issues as well as try to keep our own messages out there. As crazy as it may sound, I think I would like to have just gone head-to-head without all of that there. Q: I heard you’ve been friends with Sen. Tim Kaine, D-Va., for over a decade. How did that start? A: It started when he was Democratic Party chairman, back in, like, ’03, I think. We met when he came to Alabama on one of his tours. We had dinner with a few other folks and stayed in touch, and I’ve known a couple of his staff members over the years. And then when Tim ran six years ago, my wife and I had a fundraiser for him at our house in Birmingham, and we just stayed in touch over the years. Sen. [Patrick] Leahy was in the Senate when I was a staffer. I started out here, and actually Sen. Heflin’s office was in the Dirksen Building. My little office in our little subcommittee of the Judiciary Committee was in the old Senate Courts Building, which is now a parking lot. It was just a very small little dingy building that needed to be torn down, but they waited until after I left before they did it. I’ve kind of known him off and on, as well, as I’ve done, at different times, political stuff with some of the other senators. But Tim’s the one that I probably have the best relationship with. Q: Tell me something about you that your colleagues don’t know yet. A: They may surmise this, but I think that being a Democrat, they probably don’t know how much I love to hunt and get out in the woods. The biggest disappointment with this campaign — and maybe that’s what I would have changed — I would have made the end of the campaign be 30 days before deer season started instead of 30 days after deer season started. I love to hunt. I hope to get out this weekend. Q: Where were you Monday when Alabama won the national championship? A: We were here for a little bit after a vote and a few other things that we did, and then we went down to Willie’s [in Navy Yard], where the Alabama faithful met. It was a packed crowd, and I stayed there as long as I could with a bunch of rowdy 30-year-olds, and then went back where I’m temporarily residing and watched the end of the game with a buddy of mine. Cats or dogs: Dogs. Love dogs. Got two. One of the things that I’m missing already are my two British Labradors that I got for my 60th birthday three years ago, Scout and Dakota. I’m allergic to cats. If you could have dinner with one person, living or dead: My grandmother. Closest friend across the aisle: Right now, it would be Sen. [Richard C.] Shelby. I can’t say that we’re close, but I’ve known Sen. Shelby a long time, since he was a state senator in Alabama and I was in college. I’m hoping to develop that friendship even more.